"An ingenious audiovisual mash-up for socio-cinephiles." MisinforMation was a serendipitous meeting of sound and image that, eighteen months ago, produced one of the BFI's most startling and uncategorisable DVDs. Originally released in December 2010 through specialist outlets only, it will now have a retailwide re-release in August this year. 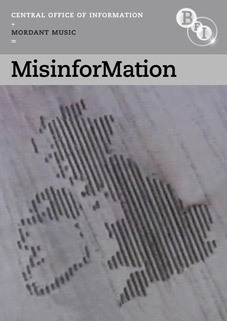 MisinforMation came about as a result of the BFI asking mysterious music makers Mordant Music to re-score an array of 70s and 80s public information films and documentary shorts produced by the Central Office of Information (COI). When the BFI took over management of the COI film collection it inherited hundreds of time-coded VHS compilations of the films. Musty and outmoded the format may be, but these tapes (compiled over the space of ten years) were, and still are, the main source of reference for the vast collection. Now housed in one of the BFI's old nitrate viewing rooms (on floor 51⁄2 at Stephen Street), it was here that Mordant Music's Baron Mordant was brought in to scroll, trawl, stumble, wind and re-wind his way through some of the wonderfully diverse films that now make up this DVD release. Some of the films are well known – AIDS: Iceberg (1986), Magpies: House (1987) – and some are from the early career of now famous filmmakers, such as Peter Greenaway's Inkjet Printer (Living Tomorrow 245) and The Sea in Their Blood. Others, such as Illusions, a film on solvent abuse (1983) and New Towns in Britain (1974) are here seeing the light of day for the first time since their original distribution. MisinforMation will be released on UK dual format (DVD and Blu-ray in the same package) by the BFI on 13th August at the RRP of £14.99.